No. 44 -S of 1926. Political Beeident in the Persian Gulf Historically used by the British to refer to the sea area between the Arabian Peninsula and Iran. 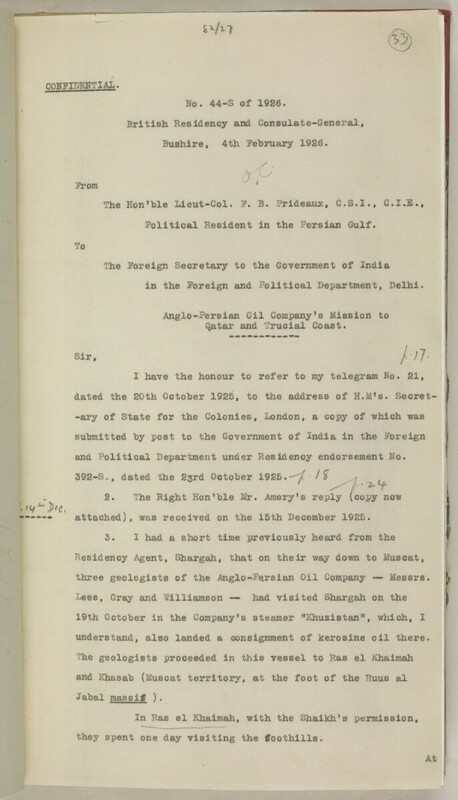 Often referred to as The Gulf or the Arabian Gulf. .
in the foreign and Political Department, Delhi. Qatar and Trucial Coast The historic term used by the British to refer to the Gulf coast of Trucial Oman, now called United Arab Emirates. .
and Political Department under Residency A diplomatic office of the British Government established in the provinces and regions considered part of, or under the influence of, British India. endorsement Mo. attached), was received on the 16th December 1925.
three geologists of the Anglo-Persian Oil Company — Messrs.
understand, also landed a consignment of kerosine oil there. ^ a ^ ai massif ). they spent one day visiting the foothills.